I first caught a glimpse of this ridiculous mess of a show when The Boy was a baby, just before he turned one. I immediately thought the show was obnoxious and annoying, and vowed to never let The Boy know of its existence. My plan was going well for a little over 2 years, and then somehow, someway, The Boy was exposed to this hellacious show. (I blame The Husband.) And like trying crack for the first time, The Boy was hooked! 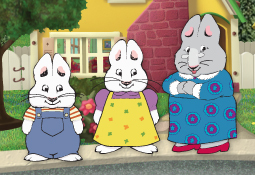 Max and Ruby is a gateway show – next thing you know, he’ll be jonesing for Caillou! Max, who is supposed to be three years old, talks like a 20-month old baby, “Frog. Frog. Frog.” He utters one syllable words while his bratty sister tries to decipher what he wants or what he’s talking about. Where the hell are their parents during all of their insane escapades? These 2 rabbits, (ages 3 and 7) apparently live alone & the only authority figure, their oblivious Grandmother, lives clear across town! Someone seriously needs to call CPS! Max is a brat & Ruby is a bossy little twit who is more interested in chit chatting on the phone with her best buddy rather than babysitting Max. And how can you blame her!??! At age 7, I wouldn’t want to be the sole caretaker for an obnoxious rabbit either. So we went through a Max and Ruby phase for roughly 2 weeks, which resulted in The Boy speaking like this flipping idiotic rabbit, Max, and me nearly losing my damn mind. “Use your big boy words to tell me what you want, you know how to talk like a big boy, stop this baby talk.” I said through gritted teeth. “No, I’m Max, mama, and you’re Ruby.” He whined, sad that I wouldn’t play. I had to have a Max and Ruby intervention & it had to happen immediately. So, I erased any and all shows that The Husband had dvr’d and promptly informed him that we were never to utter the words “Max” or “Ruby” in my house again. If The Boy asks, Max and Ruby are dead. Kidding. Kind of. “Max and Ruby! Max and Ruby!” He chanted when I asked him what he wanted to watch the other morning. 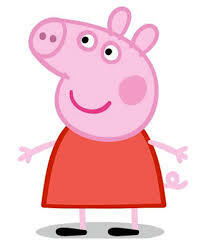 “Awa, Max and Ruby show has been cancelled, Boy.” I lied, feigning disappointment. Parents, beware, these two rabbits are NOT good role models! Keep your children away from this travesty!